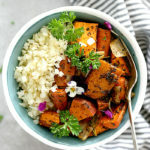 Savory roasted sweet potatoes, carrots and onion over cauliflower rice is a family favorite Buddha bowl ready in minutes! 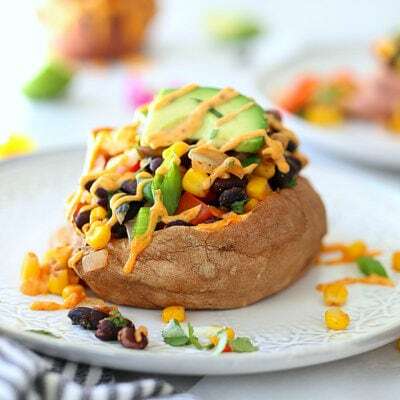 This Buddha bowl is deliciously packed with irresistible flavors and caters to most diets including paleo, gluten-free, Whole 30, and vegan! 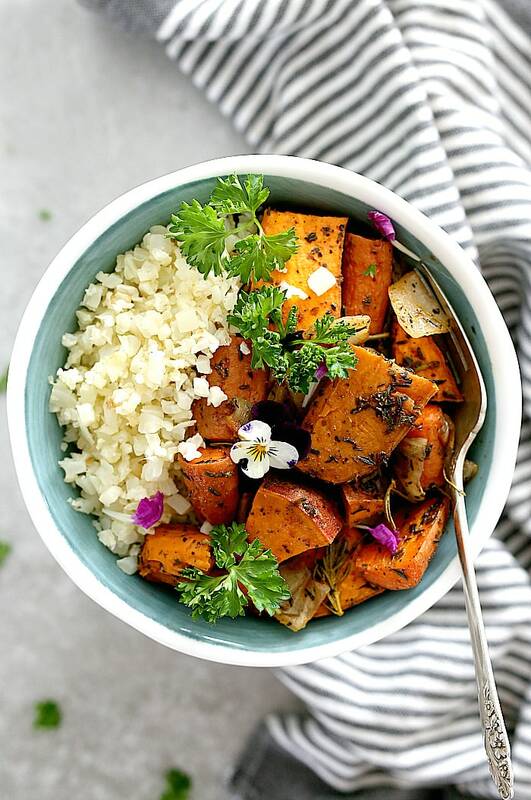 These savory roasted sweet potatoes with carrots and onion encompass bold flavors from roasting and herbs; to be served as a main dish over cauliflower rice or as a side with salmon or meat. 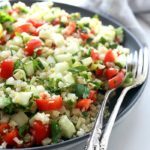 It is so easy, nourishing and makes dinners and meal prep a breeze! 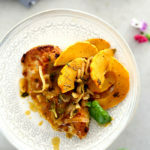 My boys hated sweet potatoes for a while- they complained they are too sweet for them. Did you catch the past tense used there, because these savory roasted sweet potatoes have been a game changer to their taste buds! If your kids are not fans of onion, I advise picking them out of their serving before they see it😊. Anyways, my boys gobbled their orange roasted vegetables right up, which totally blew my mind! 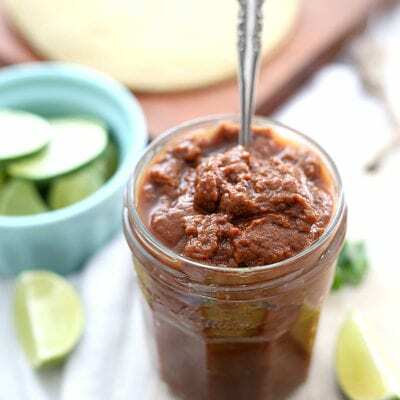 This recipe will totally blow your mind too! Buddha bowls use minimal dishes when roasting most of the ingredients – yes! That is one thing I just love about them. They are also a great way to eat a whole bowl of plant-based wholesome ingredients, which are also good for meal prepping. Make a big batch for dinner and add leftovers to meal prep containers for lunch the next day or throughout the week. To save time, you can always chop up the vegetables over the weekend and quickly roast them for dinner during the week in 30-35 minutes. While the sweet potatoes and carrots are cooking, the stove and your hands are free to sauté cauliflower rice or a favorite meat. Some nights we like to have dinner themed to be a certain color. Green is usually a spinach salad or pesto pasta, red is marinara based pasta, yellow is spaghetti squash and for orange we roast orange vegetables or serve carrot soup. It is a fun way to get the kids involved in the cooking and picking out produce. These savory roasted sweet potatoes and carrots are fun for the kids for orange night! Roasting vegetables is one of my favorite ways to make a quick delicious vegetable side dish. First chop the vegetables into cubes. Make sure they are all about the same size so they cook evenly. 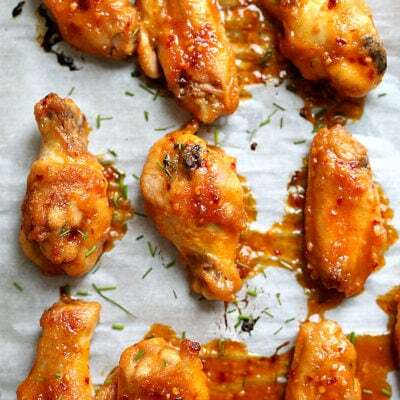 Lay them on a sheet pan and drizzle with olive oil, salt, pepper, and herbs. Then using your hands, toss to coat them evenly then spread the vegetables out on the sheet pan, making sure they do not overlap. Bake at 400 degrees for 30-35 minutes, flipping them after 15 minutes. Since these are thick vegetables, I like to cook them for about 35 minutes or until tender and crisp. When I bake soft vegetables such as zucchini, squash and eggplant, those can be cooked for 20 minutes so that they do not get too soft (zucchini particularly). Sweet potatoes and carrots are an excellent source of vitamin A, which helps promote healthy eyes. They both also contain fiber which helps to keep the body regular and push cholesterol through the body. 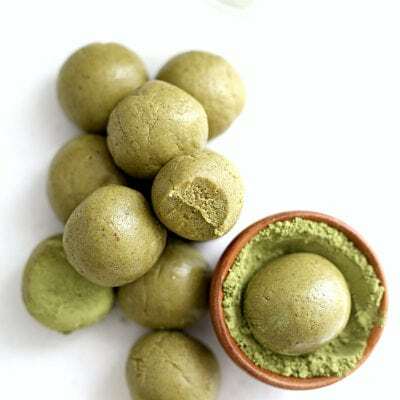 They are high in antioxidants which help prevent cancer and eliminate free radicals from the body. Too many free radicals causes damage to the cells. Sheet pan vegetables are the ultimate easy dinner to make that is healthy, delicious and so versatile. You can bake your favorite veggies on a sheet pan- ready in less than an hour. 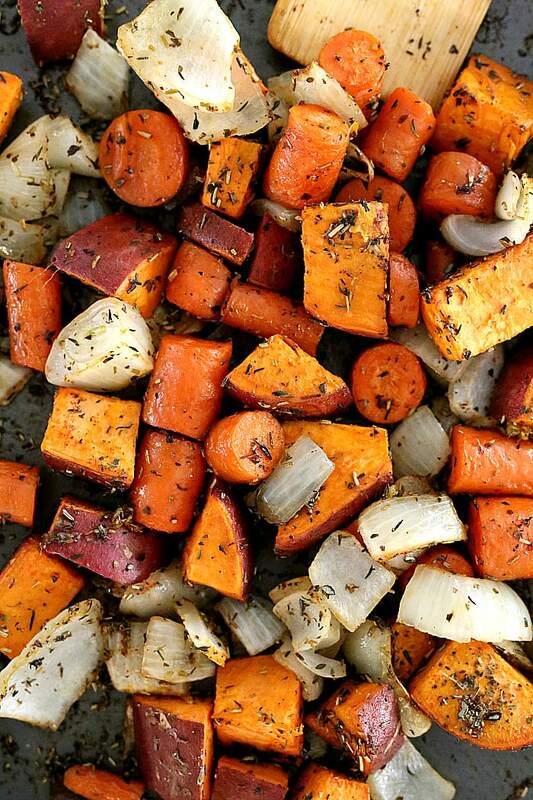 To save more time, roast vegetables ahead of time and heat them up at 350 for about 15 minutes. Then enjoy them Buddha bowl style which is rich in fiber and will keep you nourished and full for hours! 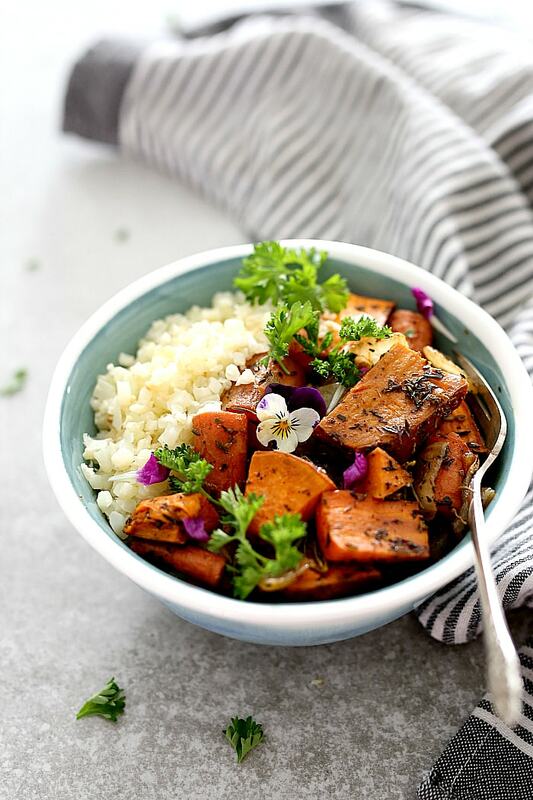 Savory roasted sweet potatoes, carrots and onion over cauliflower rice is a family favorite Buddha bowl ready in minutes! This Buddha bowl is deliciously packed with irresistible flavors and caters to most diets including gluten-free, Whole 30, Paleo and vegan! Preheat the oven to 400 degrees Fahrenheit. Slice off the ends of the sweet potatoes and then in half horizontally. Then dice them into about 1-inch cubes or large chunks. Slice the ends of the carrots and peel them then dice them into 1 inch cubes or large chunks. Slice off one end of the onion and peel away the first and second layer. 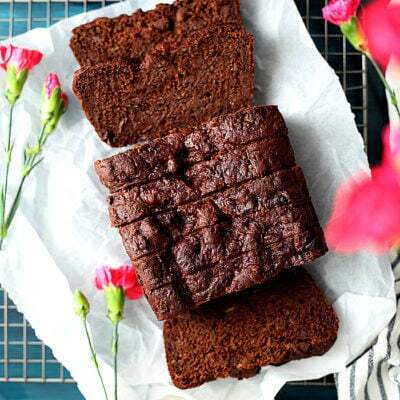 Slice in half and then into 1-inch cubes or large chunks. Mix and spread all of the vegetables on a sheet pan. Pour 3 Tablespoons of olive oil on top and spread evenly the rosemary, basil, oregano, 3/4 teaspoon salt and garlic powder. Using your hands mix to coat evenly then spread the vegetables out evenly again so they do not overlap. Bake for 15 minutes, then flip and bake for another 15-20 minutes until tender and slightly crispy. In a saute pan, heat 1 tablespoon of olive oil and cauliflower rice on medium-high. Cook and continue to stir for about 7-10 minutes or until the cauliflower is cooked through. Turn the heat down if it starts to burn. Add remaining 1/4 teaspoon of salt and mix to combine. When the vegetables are finished cooking, in 2-4 large bowls or plates add the cauliflower rice and savory roasted vegetables. Garnish with parsley and optional to add a splash of fresh lemon juice. These savory roasted sweet potato, carrots, onion and rice Buddha bowls are good for meal prepping. 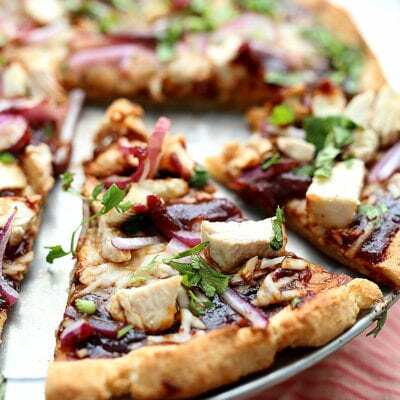 You can make this in advance and add to meal prep contains or reheat for a quick dinner. To reheat, heat the oven to 350 degrees F and cook covered in a baking dish for 15 minutes or until the roasted vegetables are heated through.